First confirmed case in California of dangerous cow toots!!! *watch that Cortez kook call for catalytic cow converters. That’s ok because the methane is beginning burned instead of released into the atmosphere. She is just flaring off the excess like any oil platform. Don't let cows watch TV is all I can say. The only place you find free cheese is in a mousetrap ! I did that back in my college days...once. Say it out loud. Roles right off the tongue. 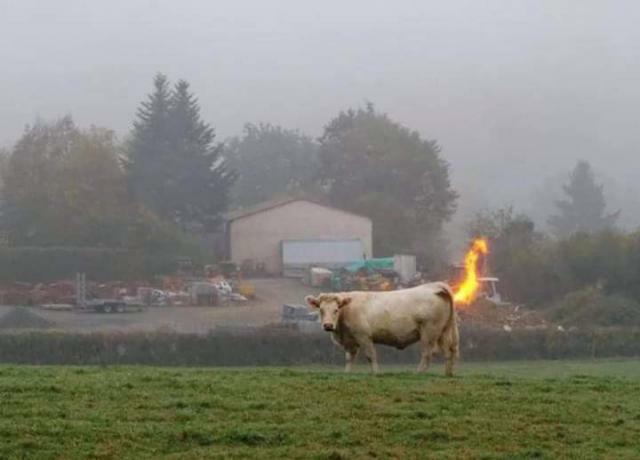 Now you can grill a cow with it's own gas. Man, don't you guys read the label?